iLift is the long awaited pre-workout from Australian brand, Cyborg Sport. Cyborg has been working on this bad boy for a long time now and have really gone to a lot of effort to nail down something new and unique to the world of pre-workouts. The most unique aspect of iLift is the ATP Engine which is a combination of ingredients that work together to create, release, and recycle energy known as ATP. You may have heard of ATP before from Creatine products which increase the amount of ATP that your muscles can store to be used as explosive energy. The ATP Engine in iLift is basically like using a creatine on steroids and without the water retention and will give you the feeling of increased and almost limitless energy to keep going and going. The key ingredient elevATP has alone been shown to increase ATP levels by 40% 1 hour after taking it, and D-Ribose, Creatine, Carnitine, and CoEnzymeQ10 enhance this even further by providing all the key components to enhance energy production. Finally, the MotorV8R is the stim complex to amp you up for a big workout. 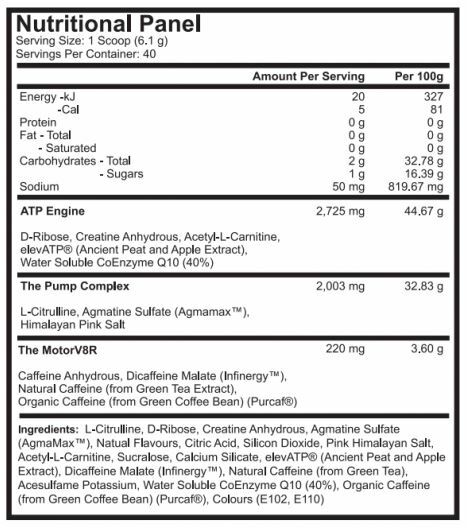 iLift contains a very strong dose of caffeine from 4 different sources. By combining regular caffeine with natural caffeines and extended release Infinergy, the stim feeling is strong but smooth at the same time. It will not cause jitters and side-effects are minimized. Combined with the ATP Engine which sustains energy levels for many hours there’s also little to no crash. 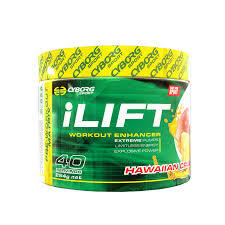 iLift currently comes in a 40 serve tub in one flavour, Hawaiian Crush which is a really delicious tropical punch type flavour. With no banned substances iLift is safe for use with competitive athletes, but is still as strong as anything on the market.